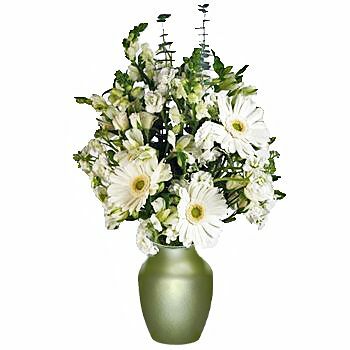 Fields of Spring White Online Flower Bouquet are the perfect way to celebrate spring. This arrangement features white Gerbera Daisies, Stock, Peruvian Lilies, Spray Roses, Snapdragons and greens. Use this fresh bouquet to decorate the home or office, give as a gift, or for any Spring event. The average height of a bouquet: 22 to 25 inches. If your event is Saturday, suggested delivery day is Wednesday. This product is available year round. These flowers come pre-arranged in a bouquet that requires little to no special prep work. Since flowers are a product of Mother Nature and due to variations in monitor resolutions, the exact color tones of this flower may vary to some degree. This item is only available for delivery in the USA (Hawaii and Alaska included) we cannot ship to Canada. Your flowers may or may not arrive with water tubes or sponges attached to the bouquet for hydration. If they do, gently remove them. Remove any plastic sleeves protecting the flowers as well as rubber bands.